Folder Redirection in ProfileUnity, This “Ain’t” your Father’s Group Policy! I often get asked about our Folder Redirection feature-set in ProfileUnity. The most common question about this is, “How is ProfileUnity’s Folder Redirection better than folder redirection with Microsoft Group Policies?” Folder Redirection is just one of ProfileUnity’s many feature-sets but it is a powerful ally for today’s System Administrators. As a rule we always suggest redirecting My Documents/Documents and the Desktop Folder as these are best practice recommendations from Microsoft as well. When these locations are redirected to a disaster recovery protected server you have a good DR plan for user authored data. 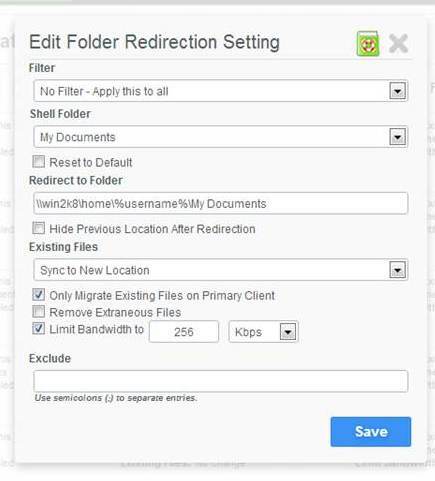 We also leverage folder redirection for certain profile configurations as well. Certain portions of the profile can be reliably redirected if your network is a singular OS. For mixed Windows OS environments ProfileUnity’s Profile “Portability” feature set can be leveraged instead. The folder redirection features in ProfileUnity were born through the requests of real-world limitations to Group Policies. Although ProfileUnity is a full User Management solution with many features, we have licensed the product to some customers for our superior Folder Redirection features alone. Ability to granularly apply folder redirection with a context aware filter- Group Policies as a limited number of ways you can apply folder redirection. ProfileUnity’s Folder Redirection works in tandem with context aware Filters that enable you to apply a Folder Redirection to more than 144 unique criteria such as a location, subnet range, OS type, and of course more common values such as Group, OU, Machine Class, etc. Ability to migrate large folders without failing- One common complaint of Group Policy folder redirection is the lack of confirmation and/or failing to move large amounts of data. ProfileUnity is very reliable and will move data over multiple logins if needed. Built-in network throttling capabilities are included so you don’t bring the network to its knees if you’ve just redirected and synced folders for hundreds or thousands of users. Zero User Downtime – By default, Microsoft’s Folder Redirection holds up a user logon. This can cause minutes to several hours of logon delay! ProfileUnity moves/migrates redirected folders in the background so the user is not interrupted or down. The user is allowed to work with their existing files during the process. After the folder redirection is complete, even if it takes multiple throttled sessions, folder redirection will automatically be switched at the next login after a final sync check. Smart sync capabilities – ProfileUnity’s Folder Redirection has smart sync capabilities. You can choose what to do with a folder’s contents including Redirect, Sync then redirect to new location, and Sync Don’t Redirect. The last one is perfect for ongoing disaster recovery or for laptops that may go offline. Sync Status Reporting – ProfileUnity’s inventory feature-set will tell you by user and folder the status of a folder redirection, whether it is in progress or if it has completed its sync. This is perfect for migrating user authored data off of legacy desktops or putting into place best practices for storing user authored data on DR protected servers. Hide Previous Location- ProfileUnity has an option to let you hide the local folder that has been redirected so users can’t easily manually save to it in the future. This is helpful because the local redirected folder may not be a part of your disaster recovery plan. There you have it, try ProfileUnity for yourself today and I think you’ll agree that we not only go beyond Microsoft’s Group Policy folder redirection but we also surpass the capabilities of most competitors in this area as well.